The Kuhailan Afas OA sireline came to Poland at the same time as the Kuhailan Haifi OA line came to Poland, in 1931. Both those stallions, along with Kuhailan Kruszan OA, Kuhailan Ajouz OA and some mares, were bought by Bogdan Zientarski and Carl Raswan for the Gumniska stud. 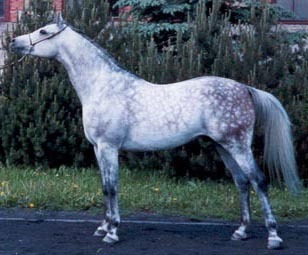 The Gumniska stud was owned by the Sanguszko family which was one of the most powerful of the noble families in Poland. Roman Sanguszko the elder was a horsebreeder (Slawuta stud) and in 1820 he was ordered by tsar Alexander I to serve in the Russian army. After 3 years he was released and in 1829 he married Natalie Potocka who shortly thereafter died in childbirth (the child, a daughter, survived). There has always been dissention among the polish nobles against the tsar rule and in 1831 prince Roman joined an uprising against the tsar. The uprising was a crushed and prince Roman Sr was sent to Siberia. 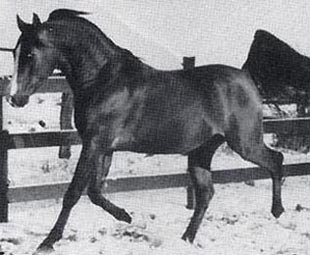 Some of his mares were taken to Gumniska, another of the studs owned by the Sanguszko family, to prevent them from being confiscated by the tsar. In 1843 he was allowed to go back home but was still forbidden to own property and he had no title. The ownership of Slawuta was transfered to his nephew Roman the younger and Satanow (the stud was later moved to the Antoniny estate) went to his daughter Marya, married to a Potocki. He still managed both estates, if not in his own name. He died in 1881 and his life was described in a short story by Joseph Conrad, "Prince Roman". Roman Jr inherited Slawuta and his brother Eustachy had Gumniska. During the Russian Revolution he was murdered and Slawuta destroyed. The estate was passed on to Roman Sanguszko, born in 1901, the son of Roman Jr's brother Eustachy. Roman fled Poland when World War I began and when he returned Slawuta was outside the polish border and Gumniska totally destroyed. He began to rebuild the breeding program and imported horses from France, the first to arrive in 1929. Damlines from the old Slawuta and Gumniska studs were also used. 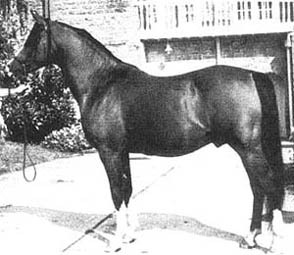 Another set of french horses came in 1931 when some polish breeders arranged an exchange with the Tiaret stud. This group included Bad, dam of Bad Afas, who introduced a new mare family to Poland, Cherifa OA. 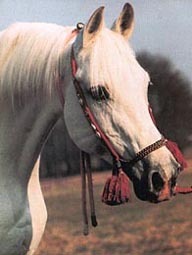 The french horses had been purchased especially for breeding racehorses and crossed very well with the desert imports. 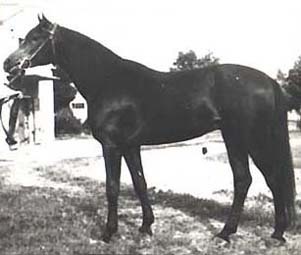 The french imports and their offspring raced very well but in 1939 prince Roman left Gumniska after the Nazi invasion. The stud was managed by Bogdan Zientarski under German rule but he had to flee eventually, threatened by the Gestapo. At the end of the war the Germans ordered the evacuation of Gumniska to Poznan. The stud which had been virtually intact during the whole war was caught between retreating Germans and advancing Russians. Needless to say, the horses did not stand a chance being trapped between two armoured divisions pounding on each other. Very few horses survived but among them was Ferha (the dam of Faher), Forta, Grand and Gabor. This sireline has not been very numerous, at least not until it was reintrodued by *Probat during the 1980ies. Kuhailan Afas OA was born 1930 in Bahrein by a Kuhailan Wadnan out of a Kuhaila Afas. He sired two sons, Drop and Bad Afas. Drop sired only one mare but Bad Afas sired two sons to continue the line, Arcus and Abu Afas. Arcus left one son, Branibor, and several mares but this branch is extinct in Poland today. It is continued in USA through Branibor's son *Dunajec. 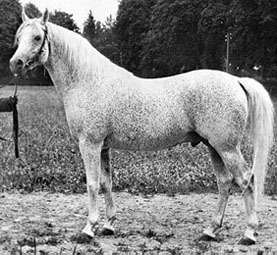 Branibor also sired the mare *Arkona (out of Adis Abeba) imp Sweden. Abu Afas sired one son in Poland, Comet, before being exported to DDR in 1955. He left several sons in DDR, among them Cid ben Afas (out of Cyneraria and imported to Sweden), Grande ben Afas II (out of Grazyna) and Galba ben Afas (out of Galka). 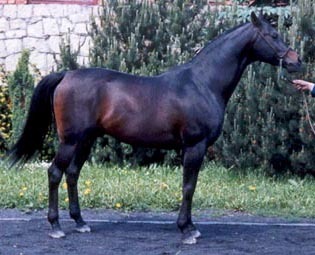 Comet was the chief progenitor of this line in Poland but died prematurely when he was only 11 years old because of colic. His get has been exported all over the world but none of his sons were able to continue the line in Poland, even though they left good mares. The line came back to Poland when *Probat was imported. He was a son of Pohaniec, a Comet son imported to Sweden. Pohaniec left several good sons and superlative mares. *Probat left many good mares but more importantly, he left a multitude of sons. From being extinct, this line has become one of the most numerous and successful lines in Poland today. 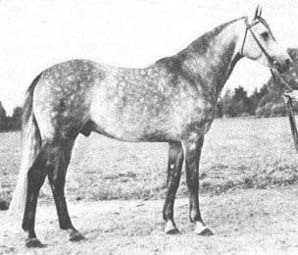 Badr Bedur, exported to France and sire of Dambor (who in turn sired Eryk imp Sweden). 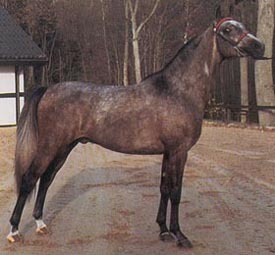 *Bajdak, sire of Pochodnia (out of Potencja) imp Sweden. 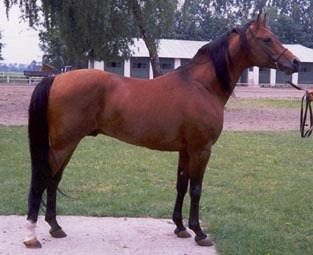 *Carrador, sire of three mares. 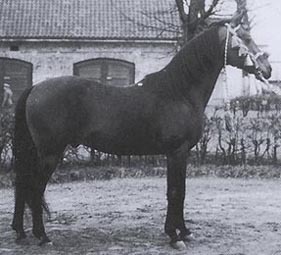 *Carycyn, sire of *Gongola (out of Gonagra), Flama (out of *Fantina) both imported to Sweden. 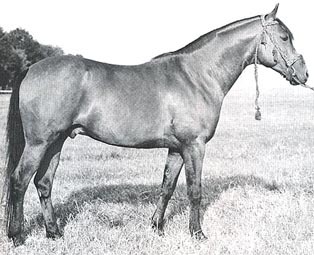 *Ego, sire of Relax who was used in Poland and Sweden. 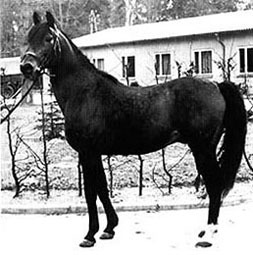 Pohaniec, imp to Sweden where he sired *Probat, *Borexpo, Pusjkin, Pomar, Da Capo, Expo, Forex and Saponiec. Bilbao, imported to Sweden. Sire of the stallion Abiram (out of Mimoza) and the mares *Cayenne, Billbosa, Bisera and Bianca. *Beldan (out of Bint Munira) imp to Sweden. Sire of Aga Khan (out of Esparda) exp UK. *Essaul imp to Sweden. Sire of many fine broodmares and the stallions *Cien, Gryf, Marszalek, *Napad and Samurai. *Mustafar (out of Musailima) imp to Sweden. Sire of the stallion Mustang (out of Sweet Nicolina) and the mares Wormusa and Maliki. *Grojec exp UK, then exp US. 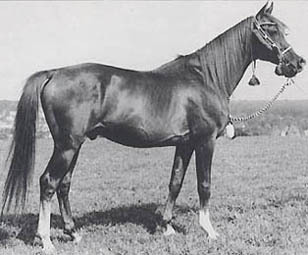 Sire of several ridden champions as well as stallions. Menelaus, first exp Germany and then to Belgium. 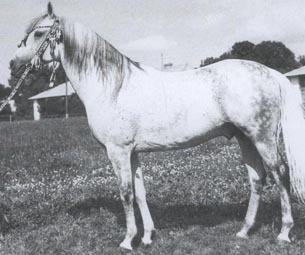 Sire of several broodmares and the stallion Elan. 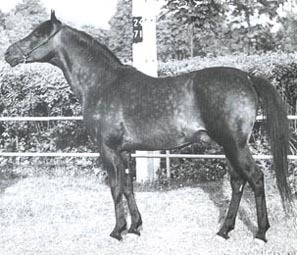 He was half brother to *Mohacz, *Mimika (dam of *Mimikra and *Meczet) and Mimoza imp Sweden. His dam Mimonka was also imported to Sweden. *Dar (out of Darda) exp US. 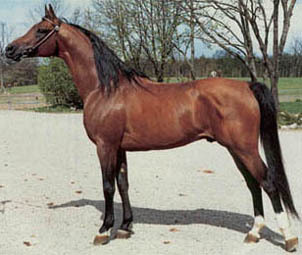 He is a class A halter champion and sire of the stallions Etnar, Medalion and Meridian. 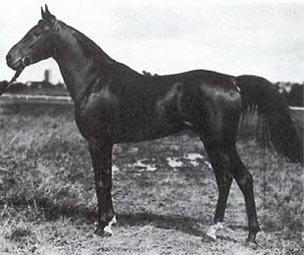 His dam Darda was also dam of Dardir (imp Sweden) and *Dornaba, both by *Nabor. *Flis (out of Forta) exp US. He has sired many broodmares. *Gwar (out of *Gwadiana) exp US. A sire of performance champions. Full brother to *Gwyn and half brother to Grobla (imp Sweden), *Gwalior and Grandorr (imp Poland). *Meczet (out of *Mimika) exp US. Performance champion and sire of good mares. Full brother to *Mimikra imp Sweden. *Wiraz exp US. 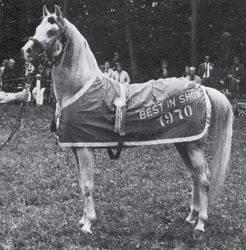 He was US Nat'l Top Ten Park Horse and has sired halter, performance and race champions. He was a full brother to *Wielka Kometa imp Sweden and half brother to *Warna, *Wiganda and Wielka Este imp Sweden. *Zbrucz (out of Znachorka) exp US. He is US Nat'l Reserve Ch Park Horse. He has sired many performance champions and many stallions. *Probat was one of three full brothers, by Pohaniec out of Borexia. 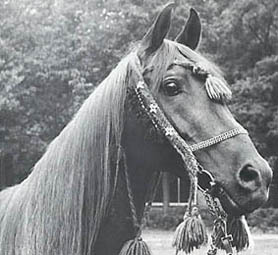 He was chosen by the polish state studs to bring back the Kuhailan Afas OA sire line that was extinct in Poland. He was used for a total of six seasons. Apart from siring many sons he also sired many valuable mares. Among his sons used in Poland are Alegro, Boryslaw, Drabik, *Enrilo, *Fawor, *Gil and Pamir. *Borexpo was exported to Germany and then to USA. He was not the sire his brother was but left some good stock. The life of Pusjkin was cut short due to an accident. He was considered very promising and was leased to Norway were he sired his only foal crop.